How does the Favino tone differ from the Selmer tone?Does it have anything to do with the size of the body? Hi all, new member here from North Wales. I'm a (sshh) ukulele player, should I even be here? I've been playing uke for about four years now and have liked Django's music since first hearing it in my Dad's car aged about 9. 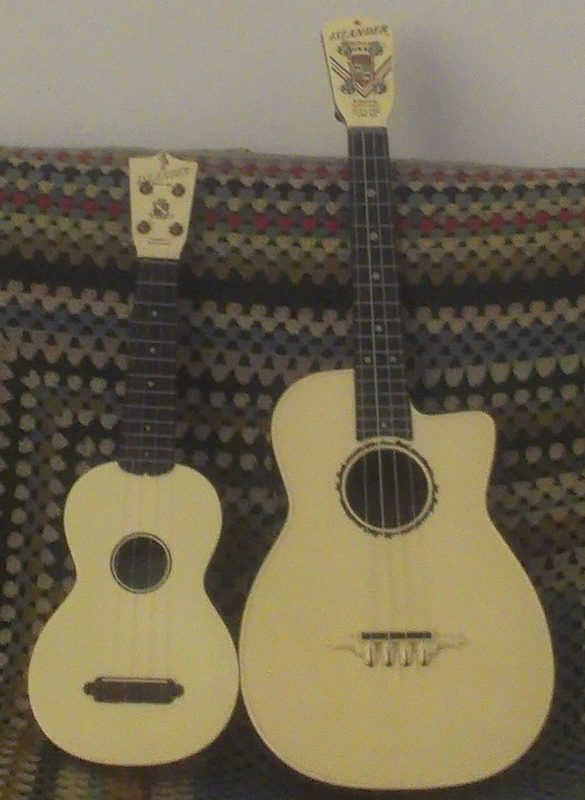 I'd never considered trying to play gypsy jazz on my ukes until I became interested in and starting collecting plastic ukes from the fifties. I was intrigued to discover that the man behind the design of the classic Selmer guitar associated with Django was none other than one Mario Maccaferri, the man credited with 'inventing' the plastic ukulele. Rather pleased with this I thought the next logical step was to try and play Minor Swing on some of my Maccaferri Islander plastic ukes and when googling about for chords and info on scales I stumbled across this site. (Thanks, Jack). In this rather rudimentary recording I've used a 1963 baritone (tuned re-entrant, similar to the bottom four strings of your guitars but the d is an octave higher: dGBE) and a 1952 soprano (tuned gCEA - like putting a capo on the bottom four strings of a guitar at the fifth fret but re-entrant). The plastic ukes give a very percussive tone with little sustain and obviously lack the bass that is probably key to this style. Perhaps best filed under curiosity.